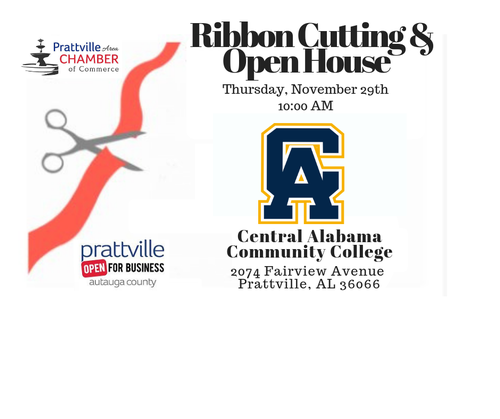 We love celebrating with our members and Central Alabama Community College has much to celebrate! Come help us cut the ribbon and OFFICIALLY WELCOME them to their NEW location in Pratt's Mill Shopping Center, across from Long-Lewis Ford, at 2078 Fairview Avenue! With Spring 2019 enrollment just around the corner, here's your opportunity to learn more about Central Alabama Community College (CACC) and to see what the Buzz is all about! CACC’s diverse programs and flexible scheduling provide a world of opportunity for state-of-the-art education and training for a wide range of ages, backgrounds, and life goals, which prepare you for a rewarding future. The Pratt's Mill location of CACC offers credit and non-credit classes during the day, night and weekend hours. Drop by and hear how they are providing educational opportunities closer to home to residents in the surrounding area while providing local workforce development within the River Region!